To put it simply, the Batman franchise is back. This is a Batman for our age, certainly: a Batman with baggage, a Batman that bruises, a p.r.-savvy Batman. Christian Bale leads a smart cast of actors disguising their accents (cheers for Liam Neeson, Michael Caine, Morgan Freeman, Rutger Hauer, Gary Oldman, Tom Wilkinson and Cillian Murphy; jeers for Katie Holmes). The first section, with its fear-induced flashbacks, hits the same expositional beats repetitively and threatens to suffocate the movie in Freudian analysis and dojo bromides. But mid-movie the prodigal Bruce returns to Gotham ready to don his batmask and do some badass battle and the plot’s clip picks up. The much-fanboy-maligned Batmobile worked for me, as did Lucius Fox, the newly-invented inventor-sidekick played by Morgan Freeman. David S. Goyer and Christopher Nolan are getting big kudos for the script. It’s fine, but let’s not get carried away. Sure, it has more heft than the usual comicbook crib, but Memento this is not. Goyer wrote the Blade trilogy, among other things, and he hasn’t blazed any new ground here. The few moments of humor are the most forced and disingenuous parts of this movie. “Nice coat,” Batman tells a bum Bruce Wayne traded jackets with earlier, a character whose sole purpose seems to be a set-up for the one-liner. Nolan the director is not interested in the plight of Gotham’s hoi polloi, and that keeps the final sequence, with its terrorist threat to the people of Bruce’s city, from having real weight. A sequel? Inevitable. I hope they can get back most of the cast. Nolan probably won’t be interested, since Batman has now conquered his psychological demons. One annoyance: we don’t actually see the secret main baddy die. We’re so well trained as movie-goers (or so cynical), that we know to expect the return of characters we don’t see annihilated or decapitated with our own eyes. They’ve also, for the next flick, locked themselves into a particular villain whose portrayal, by Jack Nicholson, is going to be difficult to top. In any case, Batman Begins has admirably re-established the series and dispelled the fears of this movie-goer, at least, that it was going to be guano. 1) “Rat Man Begins” – Rat Man is a tortured, tragic hero. After losing his parents to a senseless mugging, he determines to strike fear into the hearts of evildoers. After a rat crashes through his window, he goes out to fight crime as Rat Man. A construction worker in his spare time, he also fights non-union labor projects as Rat Man, though this often just means standing across the street from buildings when the union’s regular, inflatable rat, has a hole in it. Ra’s Al Guhl is trying to renovate his apartment complex using cheaper, unorganized workers. Rat Man to the rescue! 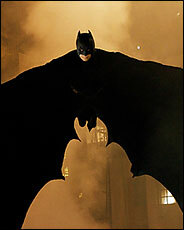 2) “Batman Begins the Beguine” – Cole Porter is a tortured, tragic hero. After losing his parents to a senseless mugging, he determines to become the greatest popular songwriter of the 1930’s through 50’s, mixing ribald wit and elegant sophistication with ease, and crafting infectiously joyful melodies. Also, he dresses up like a bat and strikes fear into the hearts o criminals with his flagrantly homosexual flamboyance. Ra’s Al Guhl is a rock and roll musician who, along with his Army of Hip-Swivelling Shadows, dominates the music charts and drives Batman and his colleagues to the margins of the recording industry. 3) “Batman Begnningan’s Wake” – Michael O’Batman is Everyman, a symbol of not only the Irish experience, but every man’s experience in life, death, and history. After losing his parents to a senseless pub-brawl, he resolves to strike fear into the hearts of evildoers by crafting multilingual puns involving a language he created, and employing a loose, episodic and surreal narrative structure. Scarecrow is a graduate student forced to read O’Batman’s book, and driven mad by it. Ra’s Al Guhl is the author of the Cliffs Notes version. 4) “Batmannequin 2: On the Move” – Batman is a tortured, tragic mannequin yearning for his glory days in the window of the Warner Bros. merchandise store in New Jersey’s Livingston Mall. When he loses his home due to a senseless shutting down of all Warner Bros. merchandise stores, he resolves to strike fear into the hearts of evildoers. Unfortunately, being a mannequin, he can not move, and so is found by a group of teenagers, who use him as a goalie in street hockey games, dress him up in women’s clothing, and eventually tie fireworks to him and blow him up. Ra’s Al Guhl is not popular enough for any Warner Bros. store merchandise to be made of him. Please make these ideas into movies and pay me millions of dollars.